Ladies and gentlemen, in the very near future, we'll have access to robots that are capable of loading and unloading our dishes. Busboys, beware - you might soon be out of a job. Bear with me, folks - this is actually significantly more impressive than you'd think. Earlier this month, a robot by the name of Boris 2 made its debut at the British Science Festival in Birmingham. 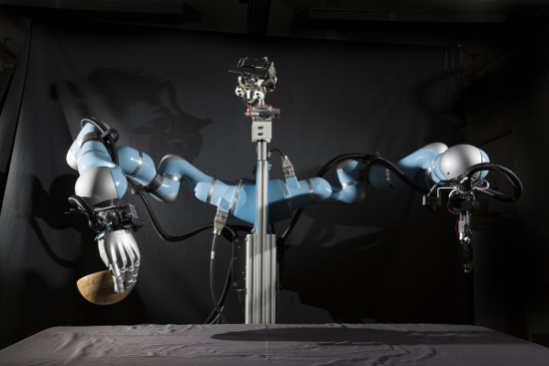 The result of five years and $570,000 worth of research, the robot manages to solve one of the oldest and most complex problems in the world of robotics - how can one teach a robot to accurately assess the size, weight, and shape of an object it's never seen before? How can a robot be taught to pick up an object with which it's unfamiliar - preferably without breaking everything in the process? Believe it or not, the calculations behind such a feat are positively herculean. There are literally hundreds of variables, and thousands of calculations that go into picking up even a simple cup - calculations that even a toddler can do subconsciously. Really, even the lowest order of monkeys is capable of picking up an object without too much exertion. Robots don't quite have that capacity yet, but thanks to Boris 2's creators, they soon might. It's one of the first of it's kind that's capable of picking up objects in a truly humanlike fashion - most robots can only pick up stationary objects of a fixed size. Boris 2, on the other hand, is able to calculate 1000 possible ways to grab an object in the span of ten seconds. After performing those calculations, it's capable of gripping the object in a number of different ways; objects are located using depths sensors situated in the robot's arms and wrists..Currently, it still has issues discerning the location of shiny objects, whose sheen confuses its sensors. So...admittedly, it's not quite as good at its job as a human being would be - but it's still capable of doing more than any robot before it. The research team responsible for Boris 2's development - consisting of mostly computer scientists based out of the University of Birmingham - believe that, by April of next year, their creation will be capable of carrying out tasks as complex as loading and unloading dishes. According to Professor Jeremy Wyatt, that's the bare minimum of what Boris 2 and its kin will be capable of. Eventually, he hopes to expand it far beyond the role of a simple robotic busboy. "It's a really interesting technology you can apply in many circumstances," said Wyatt, speaking to Business Insider. "Our next step is working with tech organizations to see how we can use robots to assemble industrial parts." He was quick to caution that his team is by no means designing an alternative to good, old-fashioned flesh and blood workers; however. Boris 2 isn't made to replace human beings, but rather to work in tandem with them. "We want to augment existing human abilities, but still get the human to do the parts of the job the robot can't do," he explained. Eventually, Wyatt hopes that the research his team performed to create Boris will lead to a revolution in the world of robotics - similar to the automation seen in the 1970s and 1980s. "Over the next four to five years, we will see a whole series of algorithms for different robot manipulations. In the seventies and eighties, we saw robotic manipulation under structured and controlled environments, like in factories. Now, we can produce robots that navigate around unstructured environments and identify and grasp unfamiliar objects. That is what is coming to the market now." Alright, so maybe bus boys won't be out of a job in the immediate future. Thanks to Boris 2, their job might simply get a whole lot easier. Time will tell, I guess?